It's official. Rodrigo Duterte is not running for President in the upcoming 2016 elections. The Davao City Mayor made the announcement during a press conference held at the Grand Men Seng Hotel in Davao City on Monday afternoon (September 7). Speaking in front of the media and a crowd of supporters, Duterte simply stated that he is not running in 2016. He added that he came up with the final decision after having talks with his family. Duterte also said that when his term as Mayor ends next year, he will hang his gloves for good. "In 2016, I will retire from public life for good. 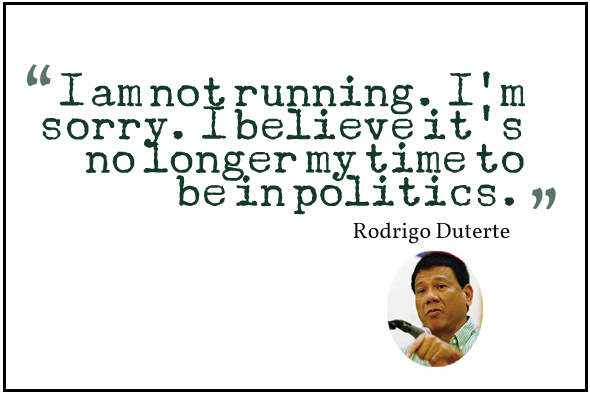 I believe it's no longer my time to be in politics," Duterte stated. His announcement caused some of his supporters present at the conference to start crying. During the 14-minute press conference, Duterte apologized to all his friends and supporters who expected him to run for the Presidency. Duterte immediately left the hotel after making his announcement. He didn't field questions from media reporters. Duterte launched his political career right after the People Power Revolution in 1986 when he was appointed as officer-in-charge Vice Mayor. Two years later, he ran for Mayor and won. He occupied the office until 1998. Because of term limits, he ran instead for Congressman in 1998 and won. He took back the Mayor's office in 2001 then got reelected in 2004 and 2007. He served as Vice Mayor from 2010 to 2013 before getting back the Mayor's seat during the 2013 elections. With Duterte off the list, Bongbong Marcos, Miriam Defensor Santiago, and Grace Poe remain as possible candidates. If indeed they will put their hat in the race, they will be joining Jejomar Binay and Mar Roxas who have already announced their candidacy.